As the fallout continues from the National Basketball Association's decision to hand a life ban to Los Angeles Clippers owner Donald Sterling for making racist comments, the emphasis is shifting back to a debate over the use of recognised racial slurs as team names. In January, hours after agreeing to become the 28th coach in the history of the Washington Redskins, Jay Gruden described the opportunity as a "once-in-a-lifetime deal" and vowed to do "everything possible to return the franchise to its former glory". Last season, the Redskins missed the NFL play-offs for the 17th time in 21 seasons. On the field, Gruden's task is to fix a team who won just three games in 2013. Off it, he arguably faces a bigger battle. The team for which he is now the figurehead is at the centre of a racism row that has embroiled a nation, even more so than the Sterling case. Politicians are pressing the NFL for action and even President Barack Obama is involved. For years, many have questioned why the team continues to use a name that Native Americans find offensive. Now a concerted campaign from politicians, lawmakers and journalists, re-ignited by what has happened with the Clippers, is bringing the debate to a head. "It's derogatory, it's dehumanising, it's degrading and it's high time this was addressed and changed," says Ray Halbritter, the leader of the federally recognised tribe Oneida Nation. "It gives the wrong message to the world. "It's hurtful for us to hear. The English Dictionary says it's an offensive term - and it is. There is no grey area. "It's bad for the image of the National Football League to be using a racial epithet and making money out of it. "The NBA has taken a courageous stand against racism in sport, acknowledging that professional leagues cannot be a platform to promote bigotry. "The NBA has shown the NFL they have a moral responsibility to take disciplinary action." Support for Halbritter is growing. In February, two members of Congress sent a letter to NFL commissioner, Roger Goodell, urging the league to "take a formal position in support of a name change". Goodell, who has refused to take a stance on the debate in the past, told reporters before the Superbowl that the league has been spending "the last year talking to many of the native American communities to make sure we understand the issues". He added: "This is the name of a football team that's had that name for 80 years and has presented the name in a way that has honoured Native Americans." But democratic Washington state senator Maria Cantwell disputes the league's position. "This term does not honour - but rather disparages - Indian people and tribes," she said. "The NFL is on the wrong side of history." In a statement responding to the criticism, the team said there are "many issues more pressing to native peoples than the name of a football team which has received strong support from Native Americans". However, district lawmakers agree with Cantwell. The Redskins originated as the Boston Braves in 1932 but a year later moved to Fenway Park and became the Boston Redskins. In 1937, they relocated to Washington, where they have remained ever since, their name transcending sport in the United States. The Redskins have won three Superbowls and boast one of the largest and most loyal fan-bases in all of sport - and they are not alone in the controversial name stakes. Many American sports teams are named after indigenous peoples but, as the years have passed, there has been an increased sensitivity to those that were thought to be crude or stereotypical. Last year, they voted overwhelmingly in favour of a change, calling it "insulting and debasing" and challenging the notion that the "Redskins" name should be kept as a symbol of the team's heritage. The case has support from the Oval Office as well. President Obama said in October of last year that, if he owned the Redskins, he would think about changing the name. "I don't know whether an attachment to a particular name should override the real, legitimate concerns that people have about these things," he said. If the President is not able to force a change, then perhaps the power of the media can. More than 70 of America's biggest newspapers have banned the use of the name in its pages, including the Detroit Free Press, the Washington Post and the Buffalo News. NBC's leading sports anchor, Bob Costas, recently condemned its use during a broadcast, while Sports Illustrated's Senior NFL writer Peter King has also taken a stance. "For two or three years, I've been uneasy when I sat down to write about the team," he said. "I've tried to use it sparingly but decided to stop entirely because it offends too many people. I can do my job without using it and I will." But for Redskins fans, like Denise Perry from Maryland - the state in which the Redskins are based - any change would represent a tarnishing of the very fabric of the team. "Calling it anything else would take away from the meaning and history of the Redskins I grew up with," she said. "If the owners ever considered a name change, I would join the protests against that." For now, protests seem unlikely, as do any legal objections. In 2009, the United States Supreme Court refused to take up the case, despite the US trademark office agreeing with the Native Americans that "Redskins" is a racial epithet. Any further challenges seem doomed to failure under the First Amendment that guarantees freedom of speech. The man who ultimately gets to decide whether the name stays or goes is Redskins owner Daniel Snyder and he remains adamant there will be no change. In a recent letter to season ticket holders, he underlined his team's position. "It will never happen," he wrote. "It's that simple. NEVER. And you can use the caps. The name was never a label. It was, and continues to be, a badge of honour." Should the R-word be banned? 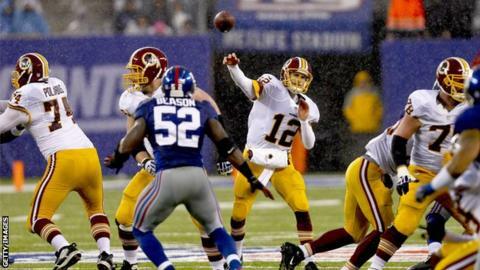 Read more on Washington Redskins: Time to change the name? A swift punishment, but is it fair? Read more on A swift punishment, but is it fair?